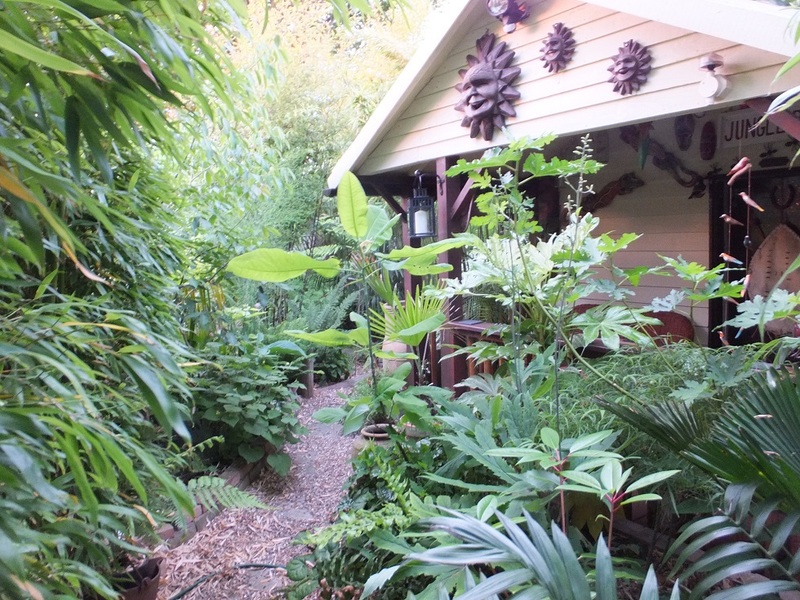 Half way down the garden is our jungle hut, marking the entrance into the jungle end of the garden. Originally a large shed we added the porch area on the front to create a secluded seating area which has featured on the blog before. Enclosed with lush planting on all sides its a great place to sit and enjoy a drink or snack in the evening. And after a long journey home from work today it was the perfect place to relax and soak in the surroundings! Nearly all the plants you can see are permanently planted out with just a couple of more tender palms in pots. Do you have a secluded spot you like to escape to after a busy day in your garden? Love this hut, I have a bench near the top of the garden that is quite secluded, makes a good bolt-hole. It's nice to have a secluded place, and on a day like today its even batter with a roof! Looks like a great spot. I seldom sit in my garden because I see too many things that need to be done. There is a 1970's high back wicker chair on my back porch in which I sometimes sit. Love it. And the suns on the front are awesome! Thanks Candice, we brought the suns back from a holiday in The Philippines. I have nothing out in the garden as secluded as yours which is fantastic. You must feel all alone and private out there which is fantastic. Thanks Cher it is great not to be overlooked despite having roughly 13 other gardens bordering onto our property. Perfect! We must be garden twins when it comes to tropical styles! I love it. I enjoy your tropical garden. Thanks David, we love visiting your garden too! Not yet but cannot wait to make such a place. Looking forward to seeing what you create Catharine. I'll be right over with a bottle of wine! That looks perfect, especially on a warm night. I'll get the glasses ready! Your hut rocks. It looks like it would make a perfect little guest house. Our garden is too small to have a secluded spot like that. My favorite way to get away from it all is to lie in my hammock looking up at the trees. We often joke that my parents could stay there when they come to visit! I've just designed a tropical garden for a college assignment - the secluded jungle hut to relax at the end of the day was factored in, with a "secret" gravel path leading through the palms and planting - I should have taken my inspiration from you two!! Great hut, Gaz! Your garden design sounds lovely! Secret paths are a great idea. We sit on our front deck (covered) in all kinds of weather to recap the day and enjoy the evening light. We'll drink a toast to you and your jungle hut tonight. Having somewhere to sit regardless of the weather is such a nice thing to have! Wow, a jungle hut sounds like a brilliant idea, so much more exciting than a shed!